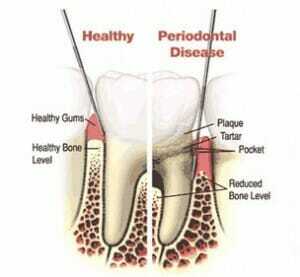 Gum disease is a condition that threatens your oral health as well as the health of your whole body. It is extremely prevalent; according to the American Academy of Periodontology, half of American adults have some form of gum disease. Unfortunately, many people are unaware they have the condition until they visit a dentist or begin experiencing symptoms. Gum disease is caused by bacteria, which form plaque on the teeth. The plaque hardens on the teeth and irritates the gums, causing unpleasant symptoms. At this stage the condition is known as gingivitis, and it can be reversed with proper treatment from a dentist. If gum disease is allowed to progress, however, the patient is at risk for serious problems. Patients with advanced gum disease may suffer loss of teeth, bone, and tissue, as well as an increased risk of heart disease, and potentially a higher risk of developing certain cancers. Pregnant women with gum disease are also at risk for premature birth. If you are experiencing any of these symptoms, it’s time to see your dentist. Gum disease treatment varies depending on the individual case. Often, it includes a procedure called planing and scaling and/or the use of antibiotics. Patients with advanced gum disease will need to see their dentist regularly to control the condition. Remember, by catching gum disease in its earliest stage (gingivitis), you can reverse the disease and restore your oral health. If gum disease is allowed to advance, however, you put yourself at risk for tooth loss and other major problems. Seeing your dentist on a regular basis is an easy way to prevent gum disease, but if you are already experiencing symptoms, it’s best to schedule an appointment right away.